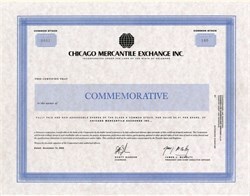 Beautiful commemorative stock certificate from the Chicago Mercantile Exchange Holdings Inc. dated November 13, 2000. This historic document has an ornate border around it with the CME's logo on top. This item has the printed signatures of the Company’s Chairman, Scott Gordon and President, Jim McNulty. These certificates were handed out on the trading floor the day of the CME’s IPO on November 13, 2000. 1961: CME introduces a frozen pork belly futures contract — the first futures contract based on frozen, stored meats. Pork bellies are used in bacon production. 1964: A live cattle futures contract begins trading at CME. This is the first futures contract to be based on a non-storable commodity. 1972: CME creates the world's first financial futures contracts by introducing futures on seven foreign currencies on May 16. 1981: Eurodollar futures begin trading, becoming the first contracts to be settled in cash, rather than the physical delivery of a commodity. The Eurodollar futures contract is the world's most actively traded futures contract. 1982: CME introduces stock index futures products, including the first successful equity index contract, the Standard & Poor's (S&P) 500 Index futures, on April 21. 1984: CME establishes the first international link between futures exchanges — a mutual offset trading link between CME and the Singapore Exchange Derivatives Trading Ltd. (SGX). 1992: GLOBEX, CME's innovative global electronic trading platform, begins providing after-hours trading on June 26. Today, GLOBEX offers trading approximately 23 hours a day, five days a week. 1997: CME introduces E-miniTM S&P 500® contracts — electronically traded products that are one-fifth the size of the standard S&P 500 Index futures — paving the way for additional E-mini products. The E-mini S&P 500 futures and the E-mini NASDAQ-100® futures are the fastest-growing contracts in CME's history. 2000: CME becomes the first U.S. financial exchange to demutualize by converting its membership interests into shares of common stock that can trade separately from exchange trading privileges. 2001: The exchange's parent company, Chicago Mercantile Exchange Holdings Inc., is formed to provide the company with additional business and strategic flexibility, among other things. In addition, CME becomes the largest futures exchange in the United States. 2002: Chicago Mercantile Exchange Holdings Inc. stock is listed on the New York Stock Exchange, making CME the first publicly traded U.S. financial exchange. History from exchange press information.